This was Monday afternoon and it could have been bad. 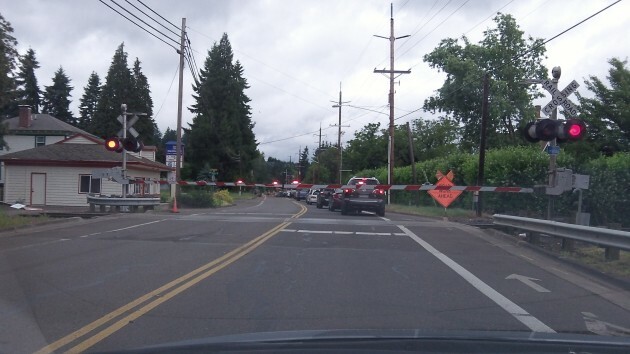 Flaggers were regulating traffic on North Albany road, and the line of stopped northbound vehicles stretched back across the railroad tracks when the crossing lights started flashing and, moments later, the gates came down. By then, as luck would have it, the car in front of me had found enough space on the other side of the tracks, and about that time the line of vehicles started moving anyway. So disaster was avoided. But from where I was sitting just south and well back of the tracks, it looked like kind of a close call. And then the front end of a pretty long freight arrived. North Albany Road from the tracks to the Gibson Hill roundabout is undergoing a $6.6 million reconstruction, which also includes a water main. Starting June 12 the road will be closed to all but local traffic. Through traffic will have to use a detour along Quarry and Spring Hill. 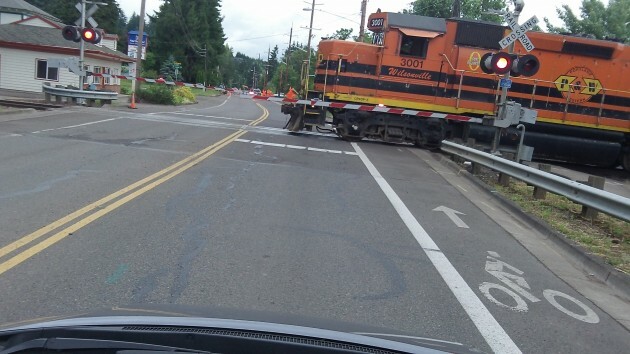 Southbound big trucks will be advised to take Hickory from Spring Hill back to North Albany Road in order to keep from tipping over while attempting the left turn at the Spring Hill light on Highway 20. Albany’s public works staff will explain all that and more — again — in a notice being mailed to all North Albany addresses, according to the Facebook page called North Albany Road Project, where you can find frequent updates.